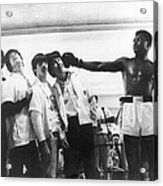 The Beatles And Muhammad Ali In 1964 by Keystone-france - 10.000" x 7.375"
The Beatles And Muhammad Ali In 1964 framed print by Keystone-france. Bring your print to life with hundreds of different frame and mat combinations. Our framed prints are assembled, packaged, and shipped by our expert framing staff and delivered "ready to hang" with pre-attached hanging wire, mounting hooks, and nails. 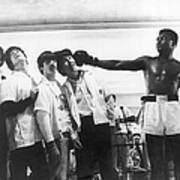 There are no comments for The Beatles And Muhammad Ali In 1964. Click here to post the first comment. UNITED STATES - APRIL 22: During a visit to the training room of the boxer in Miami, the BEATLES were acting as they were knocked out by the American boxer Muhammad ALI, became recently boxe World Champion. (Photo by Keystone-France/Gamma-Keystone via Getty Images)Image provided by Getty Images.